Rick Harrison and horses began their life together from an early age. A ten year old Rick spent his holidays helping out with the horses at his Uncle, Terry Harrison's spelling property, PInecrest Park. Five years later, Rick started his apprenticeship as a jockey for Jack Jury who was a leading jumps traier of his time. He soon grew too large to make race riding his career (today he stands at 6 foot tall) and changed his career path, going to work with John Allen for a number of years then Mick Kent where he stayed for a period of two years before Mick left to run his operation in Singapore. Rick was an excellent horseman who had a talent for horse breaking. 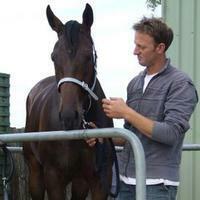 After working with Mick he took a turn at professional horse breaking and worked at Cadet Lodge for trainer Greg Eurell. He worked as foreman, breaking and pre-training up to 60 horses a week. Rick's work ethic was unquestionable with long days and complete dedication to his craft. He worked with Greg for a period of five years before he branched off on his own and began RWH Horsebreaking in 1997. Rick had several high profile trainers who supported him in his early years to which he was grateful, with many of them still using Rick's services today. Rick met Jo at Greg Eurell's where she was working in the stables in the morning and was busy with her international eventers during the afternoons. From humble beginnings, Rick and Jo have today created a reputable and sort after business where they are renowned for their attention to detail and horsemanship. In 1999 Rick obtained his trainers license and RWH Thoroughbreds evolved with today providing a full service stable, from breaking, pre-training, to training and rehabilitation. Rick's uncanny ability to bring an old horse back to form is a reflection of his horsemanship and love of the thoroughbred. He has gathered a reputation for resurrecting the racing careers of tired horses. Rick has taken his good grounding and together with Jo, has carried his experience forward to his operation today. Rick's excellent rapport with fellow trainers and attention to detail is only supported by his commitment to maintain a maximum level of horses in his care at a given time. He has experienced success in all areas from breaking in group one winners, to Olympic level performance horses and in recent times enjoying his excellent achievements with racing his horses. Rick and Jo look forward to a lifetime together doing what they love.